(AP) -- Nissan showed off its Leaf electric car Friday, trumpeting its zero-emission technology and practicality with video of the hatchback zipping through snow and water. The car, among the world's first mass-market electric vehicles, is already sold out until March 2011 because of limited production capacity. There have been 6,000 orders in Japan and 20,000 in the U.S. It arrives in Europe next year. 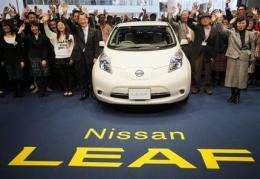 "This day has finally arrived," a grinning Nissan Motor Co. Chief Operating Officer Toshiyuki Shiga said, before posing for photographs with Japanese customers who had placed orders for the Leaf. "The curtains are about to rise for a new era in the auto industry." The manufacturer's suggested retail price in the U.S. is $33,600. Some states offer incentives and rebates for the electric car, and a taxpayer can claim a $7,500 federal tax credit for purchasing a Leaf in the U.S. The Leaf joins a small club of commercially available mass-produced electric vehicles. General Motors Co.'s Chevrolet Volt - which costs $41,000 - goes on sale this month. The i-MiEV minicar from Mitsubishi Motors Corp. went on sale in Japan in April and costs 2.84 million yen ($34,000) with green incentives. The Leaf is rated at 99 miles per gallon in the U.S. The Volt gets 93 miles per gallon. Mileage has not yet been released for the i-MiEV planned for the U.S. market next year. The Leaf goes 200 kilometers (124 miles) on a single charge under Japanese regulation test conditions. The Chevrolet Volt goes about 35 miles (56 kilometers) on its battery before a gas engine kicks in and generates electricity to keep it going. Shiga acknowledged production won't keep up with demand for a while and some customers are going to have to wait months for the Leaf. The Leaf is now being produced only in Japan with production capacity at 50,000 a year but production is set to start in the U.S. and Great Britain in 2012 and capacity will rise to 250,000 vehicles, according to Shiga. Yoshihiro Maruyama, 67, a retired farmer, said he was not happy about having to wait until February for his Leaf but he was thrilled about being a future owner. "I wanted to be the first to drive it," he said, adding proudly: "You can charge this thing at home." Nissan also showed how it was working with apartment complexes and community groups to encourage widespread adoption of electric vehicles through car-sharing and partnerships with local governments. The big sticking point is the need for charging stations and other infrastructure. Rempei Matsumoto, author of a book about green vehicles, believes the Leaf is for now little more than an image perk for Nissan. Experimentation in electric vehicles dates back decades but their consumer use is expected to be limited for years, he said. "They can only be used for limited distances such as picking your kid up from kindergarten or going grocery shopping," he said in a telephone interview. A good compromise may be gas-electric hybrids such as Toyota Motor Corp.'s hit Prius which travels a limited distance on the electric motor but never runs out of a battery charge because it also has a gasoline engine. Toyota is introducing an electric version of the iQ ultra-compact in 2012 and is working with Tesla Motors Inc. on an electric RAV-4 sport utility vehicle. Honda Motor Co. sells three hybrids, the Insight, CR-Z and Fit, and plans an electric vehicle in 2012. Even Nissan, long upbeat on electric vehicles, has recently come out with its own hybrid, the luxury Infiniti M.
The Leaf is designed to connect wirelessly to a data center so that owners can use their smart phones to remotely recharge it in situations such as when the car is connected to a home charger. To highlight the green message, Nissan used recycled material for the interior, including seat covers that use synthetic cloth made of recycled plastic bottles. The car is almost completely recyclable, it said. I wonder who will be the first to carry a portable generator in the trunk, say 10hp, and run the Leaf golf cart, er, car, on that when needed to increase the range, and then fudge the control system so it can be simultaneously charged and driven. Interesting possibilities there are. As long that the energy comes from renewable resources i have no problem with that! Electric revolution of cars = green revolution of energy!